If you haven't seen my announcement on Social Media (which you probably have; I post there a lot more than here, haha), then there is some good news. Tale of the Mothman's Return will be available October 13th! That's right, after all the waiting we have a release date set in stone. And how perfect; I was able to launch it on Friday the 13th! Tale of the Mothman's Return Can Be Yours FREE! You read that right. 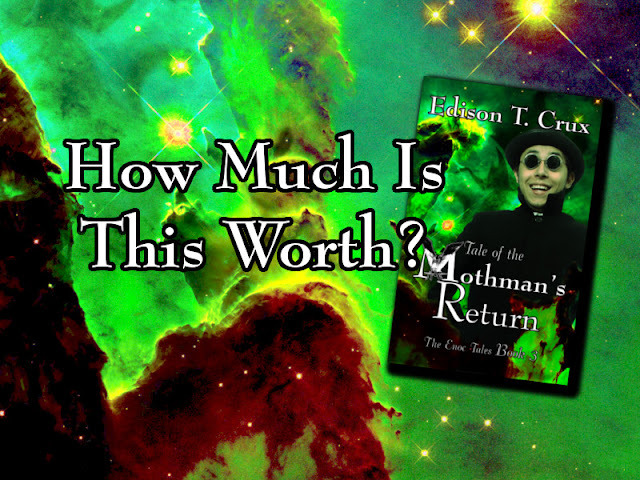 I will be making the PDF version of Mothman's Return available for any price you want, even no price at all. It's a concept called Pay What You Want, and I gotta say I love the whole idea. Once Mothman's Return comes out, there will be a page on EnocTales.com where you can get the PDF ebook. It can be yours—no strings attached. But, you are encouraged to pay what you feel its worth! That might be $0.50, or it could be $3.00—or even $0.00. The point is, you decide how much to pay for it. Or, you can get the book for free, read it, then COME BACK and pay what you feel it was worth to you! In other words, it's completely backwards from how things are normally sold. But I stand behind these stories, and I believe when you put it down you will HAPPILY pay for the experience. Think of it like leaving a tip for good service. It Won't Stop There—I'll be doing the same for the ENTIRE Enoc Tales! Every single book will be available as a PDF that you pick the price for. From the shorter novellas such as Hawaiian Night-Marchers to the full-length novels like Wisconsin Werewolf and Twin-City Vampires, it'll all be open for anyone to try. Some people prefer reading on the Kindle format instead of on a PDF. Which makes sense; it is more portable for reading on your phone, or dedicated e-reader. This Pay What You Want Offer is only on the PDF, but I Have reduced the cost of the Kindle versions as well. That way it's still affordable to have it that way, but if you want to read some of it first you can. Why Make The Books Pay What You Want? Have I gone crazy? Am I giving up on making money from writing? In fact, I honestly believe this will boost business substantially. Time will tell on that part, but it's worth mentioning what brought me to this radical idea. I love to read. I have no idea how many books I've read in my lifetime, but I can say it's a pretty big number. But how many of those books did I pay money for? That's a surprisingly small number. I read a lot of my favorite books by borrowing them from the library, catching a Kindle deal, or a friend lending it to me. And I almost never spend money on an author I don't absolutely love. If I already know an author, and consistently like what they write, I'll happily spend money on a new book. Otherwise, forget it. There are too many bad books out there. It's already a let down if you invest time in a book that turns out to be a dud. If you also invested money, it's a double let down. Not everyone likes ebooks. Obviously, I can't give everyone paperback copies of the book for free, so those will still involve paying money for. This is the least important point here, but it's worth mentioning that there are still plenty of ways to turn a profit from these stories—especially if the fan base is allowed to grow. I love recommending good books to my friends. But even with a glowing recommendation, it's hard for your friends to justify buying a book you recommend (for all the reasons above). Removing a cost barrier makes it incredibly easy to share these books. That will allow the fan base to really grow, at a speed that just couldn't happen behind a price tag. When you go above and beyond for people, they notice. When you provide something of real value for free, you generate goodwill. The goodwill of your audience will pay off in a million unexpected ways. That's why I'm not "giving them away for free," exactly. You pay what you feel it's worth, when you've decided the value. Will some people pay nothing? Of course. But I know the fans who consistently love my writing will happily, willingly, pay a fair price for it. And many newcomers will still pitch in a dollar or so, just because they don't have to but get to choose to. And when you finish the last page of ANY of my books, I want you to feel value. If not, then you shouldn't have had to pay for it in the first place. I trust them to pay what it's worth to them. I trust them to tell their friends about these books—especially if they are "free." I trust them to create a momentum of excitement that is natural and contagious. I trust them to make this series the best it can be. I can write the stories, but I can't make the community alone. That's the big news of the day. As the next Enoc Tales book gets ready to launch, the entire series becomes easier to access. This is a very exciting time, and I hope you are all as jazzed as I am! Here's to Tale of the Mothman's Return, the next and best book in the series! Mark your calendars for October 13th! I Love the "Pay What You Want" model... but I'm an old school kind of guy - I'm looking forward to purchasing a signed copy of the paperback!